Oscar Bao an all-in-one big data analytics platform includes Lumet, an advanced data visualization module. Lumet combines data visualization with infographics into a ‘storydashboard’; a series of interactive visualizations of the data and predicted results laid out logically and clearly. It is a solution for big data that brings analytics straight to the browser, rather than during the data set-up stage, so users and analysts can work with the data on the fly. Lumet enables users to build and interact with their dashboards in any standard browser and on any platform, allowing them to work on all of their big data. It provides easily accessible insight to the user enabling on-demand queries and ad hoc analytics. Assoc. 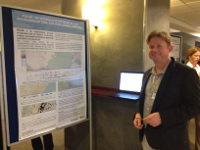 Professor Simon Attfield and Professor William Wong participated in JISIC2014 in The Hague. They presented work from the Pattern of Life Visualisation Experimentation project on behalf of the DSTL-funded project between IDC and MASS Consultants Ltd., and an initial paper from the VALCRI project on “How analysts think (? ): Early Observations”. 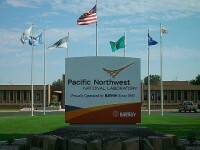 Ashley Wheat recently made a visit to the Information Visualisation and Visual Analytics team at Pacific Northwestern National Laboratories (PNNL) in Tri-Cities, WA. 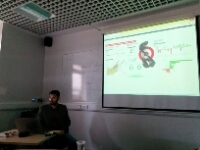 He presented a seminar on his research in Understanding External Sensemaking in Intelligence Analysis. Ashley was also able to spend time with the researchers and developers at PNNL responsible for visual analytics tools such as IN-SPIRE, Scalable Reasoning System (SRS) and LiveWall. Two teams from IDC submitted entries to the 2014 VAST Challenge. In response to Mini-Challenge 2, a team led by Simon Attfield collaborated with a team at MASS Consultants Ltd. led by Dr. Adrian Wagstaff and James Bulloch to create a suite of visualisation tools which they used to analyse GPS and financial transaction data of employees working for a fictional company. The task was to characterise regular and unusual behaviours. The work culminated in an ‘Analyst’s Day’ in which IDC staff worked on the problem with a group of ex-military intelligence analysts at MASS’s training facility. Another team led by Kai Xu, together with Bob Fields and Phong Nguyen, addressed the mini-challenge 3, whose goal is to provide real-time situation awareness using Twitter-like data for a fictitious kidnaping case. A visual analytics tool, SAVI (Social Analytics Visualisation), was developed to provide text analysis and geo-temporal visualisation. Findings from SAVI were further analysed in SenseMap, a sense making tool developed by the same team, for hypothesis and narrative generation. Both teams were awarded ‘honourable mention’ by the VAST Challenge Committee. They will present their solutions at the IEEE VIS2014 conference in Paris in November.